A long-lived patch of warm water off the West Coast, about 1 to 4 degrees Celsius (2 to 7 degrees Fahrenheit) above normal, is part of what's wreaking much of this mayhem, according to two University of Washington papers to appear in Geophysical Research Letters, a journal of the American Geophysical Union. "In the fall of 2013 and early 2014 we started to notice a big, almost circular mass of water that just didn't cool off as much as it usually did, so by spring of 2014 it was warmer than we had ever seen it for that time of year," said Nick Bond, a climate scientist at the UW-based Joint Institute for the Study of the Atmosphere and Ocean, a joint research center of the UW and the U.S. National Oceanic and Atmospheric Administration. 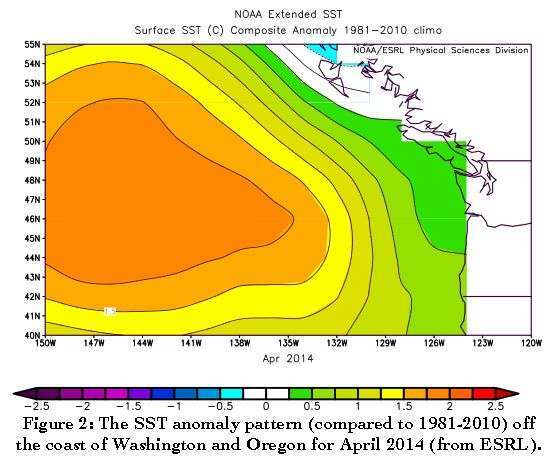 Bond coined the term "the blob" last June in his monthly newsletter as Washington's state climatologist. He said the huge patch of water - 1,000 miles in each direction and 300 feet deep - had contributed to Washington's mild 2014 winter and might signal a warmer summer. The new study explores the blob's origins. It finds that it relates to a persistent high-pressure ridge that caused a calmer ocean during the past two winters, so less heat was lost to cold air above. The warmer temperatures we see now aren't due to more heating, but less winter cooling. Co-authors on the paper are Meghan Cronin at NOAA in Seattle and a UW affiliate professor of oceanography, Nate Mantua at NOAA in Santa Cruz and Howard Freeland at Canada's Department of Fisheries and Oceans. The blob's influence also extends inland. As air passes over warmer water and reaches the coast it brings more heat and less snow, which the paper shows helped cause current drought conditions in California, Oregon and Washington. The blob is just one element of a broader pattern in the Pacific Ocean whose influence reaches much further - possibly to include two bone-chilling winters in the Eastern U.S.
A study in the same journal by Dennis Hartmann, a UW professor of atmospheric sciences, looks at the Pacific Ocean's relationship to the cold 2013-14 winter in the central and eastern United States. Despite all the talk about the "polar vortex," Hartmann argues we need to look south to understand why so much cold air went shooting down into Chicago and Boston. "Lately this mode seems to have emerged as second to the El Niño Southern Oscillation in terms of driving the long-term variability, especially over North America," Hartmann said. "This is a taste of what the ocean will be like in future decades," Bond said. "It wasn't caused by global warming, but it's producing conditions that we think are going to be more common with global warming." If its a crisis then why after 34 years of climate action failure are scientists not breaking the rules to say "proven"? We do think we know what's going on. This is the other end of Arctic Amplification. No doubt less than one half of one percent of the atmosphere caused The Blob. This is truly frightening, if it persists or repeats. It means that mankind has changed the hydrothermal equilibrium of the planet. It will take a while to change it back, if this is the case. What has happened is that the driver of heat; gradients between the Equator and Poles have become diminished by polar ice recession. 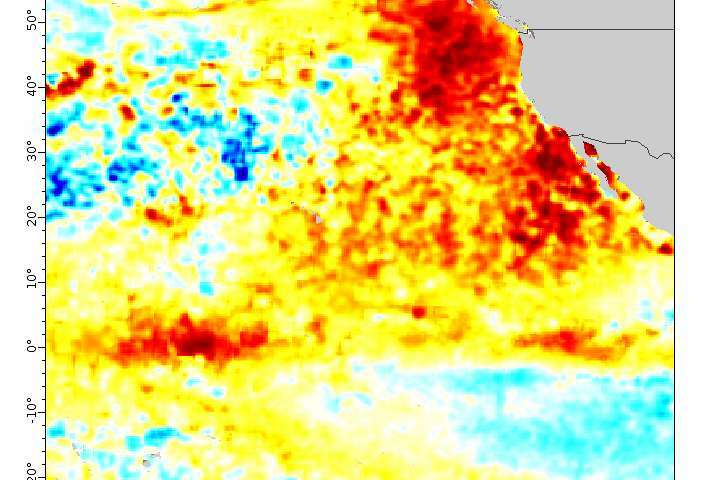 The oceans just aren't cold enough to drive anymore. Of course we see a complementary effect with land, which heats up and cools down quickly-that and prevailing winds describe both US coasts adroitly. It is obvious and predictable what is occurring, if we just think about it. Pollutants of this kind are all over the world, they all have to do with fossil fuels. Yet CO2 is the primary suspect. So it is not persistent, so what, it has been constant. "Of course we see a complementary effect with land, which heats up and cools down quickly---"
At least in California the land as not been cooling down quickly, nighttime temps are at record highs. "I'LL BELIEVE IT'S A CRISIS WHEN THE PEOPLE WHO TELL ME IT'S A CRISIS START ACTING LIKE IT'S A CRISIS." Yeah, .. Bush and Cheney screamed and screamed, . . from their reinforced bunkers and undisclosed locations! vietvet, making science intuitive is important, and you are wrong. Science is all about breaking difficult concepts down to the point of comprehension, or intuition. Of course, to a degree but, that intuition is impotent without underlying fundamentals ie Knowledge in conjunction with Training and especially Laboratory Experience & that means a keen understanding of "Experimental Methodology" - heard of any of those items, did u perhaps get ANY of them during tutelage of your claimed "4 technical degrees" ? No, not "all about" you naive dimwitted liar of; degrees, material properties, claims of bots. Science = "The disciplined acquisition of knowledge"
Its essential evolution arises from concerns religion & those with a loud voice made mere claims ! Well, climate scientists are plenty worried about methane too, as it is an even more potent GHG than CO2 ~ 25 times larger radiative response, molecule for molecule. Furthermore there are VAST reservoirs of methane trapped as clathrate hydrates (many hundreds of gigatonnes of carbon) at the bottom of the ocean and in permafrost, which may be destabilized as global surface temps increase (the "methane gun hypothesis"). But you have stated many times that you don't believe in the GHE, so why are YOU worried about methane? If methane ain't doin' it, and water vapor ain't doin' it, and smog and soot and other from countries that don't regulate their atm. pollution ain't doin' it, then the very minor contribution from CO2 ain't doin' it either. :( Well, the above article suggests it's dawning on too late anyway, doesn't it? Big oil has had you folks jousting windmills, while Rome burned. You didn't answer my question. Why are you worried about methane, if you claim it's not impacting global climate through the GHE? By which physical mechanism do you implicate methane as a concern re: climate change? Then FFS why do you refuse to prove your claim CO2's radiative forcing is a low 0.00009W/m^2 when the accepted figure is approx 1.5W/m^2 ? .. pollution ain't doin' it, then the very minor contribution from CO2 ain't doin' it either. You are complete crackpot aren't you, your flawed logic is letting you down and everyine badly, PROVE your claim your figure for CO2 of 0.00009W/m^2 has some foundation ? Please take your meds urgently. PLEASE prove your claim re CO2 being a "red-herring" and especially HOW you can claim your faked figure of 0.00009W/m^2 is somehow in "great agreement" with 1.5 ? Can u, please have the intelligence & integrity to PROVE ? There, there Mikey. You're a good boy, Mikey, you're so smart and everyone on this site sees it and knows you are very smart. Good boy, your mama loves you and your papa loves you. Everybody loves you and can see how smart you are. See, Mikey, HeloMenelo loves you, and if he loves you, everybody loves you and everybody can see how intelligent you are. Cue the nutbars to start debating the merits of denying the collective destruction of our planet. Oh wait I was a little late to the party. Believe it or not, we're all in agreement about the destruction of our planet. We disagree to the mechanism, but CleanEnergy's comment is pretty powerful and worthy of deeper consideration. Destruction is a bit subjective here. I don't see building houses as "destruction"
Bongstar-you're quite right, the Earth will get on quite well without us. Sorry. I don't believe "destruction" of our planet, at least via the climate change phenomena, is imminent. It's far more likely to happen through nuclear holocaust or a natural disaster such as multiple volcanic eruptions or a meteor strike. The Earth isn't going to be destroyed just because it has extra CO2. Blah ..blah...Oh wait I was a little late to the party. Well, you can't be faulted for being born slow, or were you dropped as a baby? Awww... was that your parents excuse after they deliberately dropped you? Can't fault them for not wanting a stupid ugly moron. Muttering Mike never took a course in Differential Equations to become a Meteorologist, I did to become an Engineer.......from your standpoint that must make me "more than smart" if you think he is "smart". So where's the high pressure ridge that's causing the blob coming from? The extreme atmospheric conditions associated with California's crippling drought are far more likely to occur under today's global warming conditions than in the climate that existed before humans emitted large amounts of greenhouse gases. So much for it not being due to global warming. You are quite right .. the Earth will not be destroyed, nobody has ever claimed that would be an outcome of climate change. Concerns over climate change are about livability of the planet for humans, and also the other plants and animals we depend on. You know, I don't care what you wannabelieve, I'm just tired of all the strawmanning and the complete lack of science from deniers. If you got science, bring it. If not, STFU. Then perhaps some need to be a little more cautious when they throw phrases like "destruction of the planet" around. To say the planet as we know it is changing would be accurate. But warming doesn't necessarily imply unsuitability for life. It simply means the life that is currently here will have to adapt with the changes. Populations that opt not to adjust will have the ability to move north and south (or to higher elevations) to remain in their native climes. Those that remain will use the tools of nature to adapt. If they can't they will die off leaving room for new species to emerge. I don't see anything dire or malevolent in this. Just a continuation of what has been happening for billions of years now. To say the planet as we know it is changing would be accurate. But warming doesn't necessarily imply unsuitability for life. It simply means the life that is currently here will have to adapt with the changes. Populations that opt not to adjust will have the ability to move north and south (or to higher elevations) to remain in their native climes. Those that remain will use the tools of nature to adapt. If they can't they will die off leaving room for new species to emerge. I don't see anything dire or malevolent in this. Just a continuation of what has been happening for billions of years now. That might be a reasonable point of view for some sort of galactic superbeing with a lifespan of several millenia, but I guess you'll understand if poor people in Bangladesh (and Florida) don't share your phlegmatic attitude about the situation. here monkey monkey... another banana is yours. Then perhaps some need to be a little more cautious when they throw phrases like "destruction of the planet" around. Perhaps others need to be a little more cautious about who they accuse of throwing phrases like "destruction of the planet" around. To say the planet as we know it is changing would be accurate. But warming doesn't necessarily imply unsuitability for life. It simply means the life that is currently here will have to adapt with the changes. Ummmm, natural selection operates by killing. Maybe you forgot. Populations that opt not to adjust will have the ability to move north and south (or to higher elevations) to remain in their native climes. Those that remain will use the tools of nature to adapt. No, they won't, they'll use the weapons of war. If they can't they will die off leaving room for new species to emerge. So far the only larger mass extinction in the history of the planet than the one occurring now was "The Great Dying," AKA the Permian-Triassic extinction event, aka the Permian Extinction. There's a current article about the cause of of the P-T extinction on this site, and that cause appears to be ocean acidification, which is happening right now due to CO₂ being absorbed by the oceans at a rate unequaled since that event. Add that to habitat loss due to warming temperatures, and we're looking at a second Great Dying, which will likely include us. Yes, life will go on. But we won't. I don't see anything dire or malevolent in this. Just a continuation of what has been happening for billions of years now. No, not really. It's only happened once before ever. ...estimates based on the rate at which the area of tropical forests is being reduced, and their large numbers of specialized species, are that we may now be losing 27,000 species per year to extinction from those habitats alone. Scientists estimate we're now losing species at 1,000 to 10,000 times the background rate, with literally dozens going extinct every day . It could be a scary future indeed, with as many as 30 to 50 percent of all species possibly heading toward extinction by mid-century. And global warming has barely even started. We're just now starting to see the first effects. BTW I misspoke above; it's not yet as bad as the K-T event, the extinction of the dinosaurs, much less the P-T event, but if this rate keeps up it will be in a hundred years. And if global warming has only just started, it's not going to just keep up, it will accelerate. Furthermore, the big risk, as scientists have been pointing out now for a couple decades, isn't warming; it's ocean acidification. And we now have pretty good proof of that, from that article on here about the cause of the P-T event being ocean acidification. We really needed to start doing something about this about 1990 or so, but SOME PEOPLE are still denying and obstructing and obfuscating. If we start now we still may be looking at losing 30% or more of the Earth's biodiversity. If we don't, we may kill ourselves off too. Last but definitely not least, it's not us turning off our lightswitches that will fix it; China is the big problem, along with the rest of Asia. China is set to build thousands or tens of thousands of coal-fired power plants over the next decade or two, and if they do, nothing the US or Europe does will matter. Now that's the science, and that shows where the most gain is to be made. The effort will be extreme, but China MUST be stopped from building those power plants. And the only way to do that is to give them an alternative. THAT is the discussion we should be having, not smartass remarks about turning off lightswitches. Aww look, a middle school popularity contest... how adorable! So, hypocritical much? Just askin'. So therein lies the difference... one group fears the worst, observing with great detail and trepidation every change that science notes, the other admits that we've never been in control and that nature has systems to deal with change. Deforestation is a concrete matter with a concrete solution. The vague "climate change" issue is not. Strawman detected. 30% dieoff isn't "natural variation." Two strawmen actually; there aren't any "systems" to deal with a mass extinction. And a lie: it's not "trepidation," and we're not cowards. You're the coward, because you need to lie. Yet another strawman. It's not "deforestation." It's difficult to condemn China for doing something the West has done for a century and only began phasing out in the latter half of the 20th century. And yet another strawman detected. I'm not condemning anyone. And an irrelevancy. It doesn't matter how much we use per capita, only the grand total, and we're not going to build thousands of coal fired power plants in the next twenty years. Still not one iota of science. You're just another denier, full of lies, tricky arguments that are logically false, and invective. Wake up, fool. That this post got so many 5 star ratings is disturbing. It seems that even the most vehement AGWers would prefer to lay the blame for climate change at the feet of someone else and pretend their hands are clean. Our energy consumption is NOT irrelevant in the least. We produce nearly 3 times the CO2 per person vs. China. It means we are nearly the most wasteful and polluting people in the world. As I've said many times before, lets do something to improve efficiency and reduce our resource demand on the planet... but NOT under the context of over-hyped "climate change" because there is absolutely nothing we can do about that. That statement doesn't even deserve a reply. And how can people down vote a post with a couple simple, referenced statistics? Some of you are just.... bizarre. Bot voting. Believe it or not. Bots or people who behave like them? Either is disturbing. Are people so ideologically stuck that even nonsensical comments like those above by HeloMenelo get rated highly.... just because they agree with his/her politics? It's disheartening interacting with supposed adults who don't seem to have the ability to do anything besides make middle-school level insults. Bots, Sockpuppets, cyberbullies, all three? There are some real princes here. It is quite possible Helo, Mike, Stumpy, thermo, others are using more than one username, but are definitely part of the same cyber-clique or bully squad. Apparently these folks are getting creepier. Docile-Dark Matter is no mystery, it is just cold planets far from stars, imagine Jupiter-like planets in the galaxies unwarmed by internal or external energies. You can't see them, they are ~ 2K, etc.. I think it is coming from land. But the Earth IS undergoing an increase in geothermal activity, I don't think any unusual forces are required to explain it. But I am not a geologist. Oh those silly cosmologists and astronomers! Always making things all science-y and complicated when there's a simple answer staring them right in the face. If only they'd thought to ask the Dunning-Kruger crowd, they'd be so much further ahead in their research! They harass dissenters so well, only people very confident in their science, if you will, survive long. Mostly by taking what a poster says and asking the "why's" like a two year old in an offensive manner. What you fail to realize is that this is not harassment at all, but the way that scientific discourse is conducted. If you have a theory that is contrary to the accepted models of how things work, you should expect (and welcome) logical challenges to your idea, and be prepared to answer all comers in straightforward terms about how your model works. You should also expect that if you CANNOT answer such questions, or give answers that contradict fundamental physics, then your alternative theories will be dismissed for the amateurish pseudo-science that they are. If, after all of that has come to pass, you continue to proliferate the same debunked pseudoscience over and over, then any other scientific claims you make will likely be similarly dismissed. It rather means, that the global warming hasn't prevailing anthropogenic origin, as I expected. It can be driven with heat generated inside of soil and marine water directly - probably with interaction of dark matter. Why do you need DM to explain this, when current models for the radiative balance of the Earth from solar radiation explain global temperature measurements fairly well (once the Greenhouse effect from the atmosphere is accounted for)? It is solar radiation that heats the surface layers of the land and oceans in that model, and there is no need for any additional sources of heat. Why do you think there is a need to look elsewhere? DLK-Hi, thermo. How many sock-puppets do you need to fail to make your point on this forum. Stumpy, thermo and now Dark Lord Kelvin. The wormies in your little silkwormbox are creepy looking i know... one day you might break the chains and discover life outside the box, just keep trying ;) but will give you a pointer (siding with big oil and politics will make them grow creepier) and in turn make you and your associates look dumber. @Thermoetctric, and yet you reply withing minutes on a topic of which you were not a part. Did DLK TELL you I made the comment, or do you just monitor old threads on the off chance your name will be used? and Here's Helo demonstrating how wonderful a sockpupet he is for Mike_M. I don't even need to know what he wrote to know what he said. Boys, or boy, if we already know what you are going to say AND it is not on topic, WHY are you posting? @WP I am curious why you think I am a "sock-puppet" for anyone else, let alone thermo. His posts and my own have nothing in common, except that we both respect scientific methodology and rational analysis, I suppose. It's also odd to me that you assume that all the other people who criticize/debunk your "theories" using fundamental principles of chemistry and physics must also be "clones" of some sort. I guess it's all part and parcel of the Dunning-Kruger pathology, telling yourself whatever it takes to minimize the impact and importance of those who don't accept the validity of your "theories". I am just curious ... has ANYONE with any sort of scientific acumen ever expressed support for and/or agreement with your theories on one of these sorts of anonymous forums? Or is it just you against the world? Very many people express agreement with them, or at least can not derive solid arguments to counter them, much like yourself and your skeptigoons. My principles are very basic, use only principles of physics and have positive direct correlations that are obvious. Usually what occurs is I drive them down the road. Them with head-nods all the ways. Arrive at the conclusion. Then they revert to whatever they believe in the first place. With prolonged contact they start to have my ideas as if they were their own. Howhot, thermo, runrig, and even Maggie have accused me of being wrong on some of the cornerstones of my basic arguments. To clarify; they tried to tell me I was wrong based on the principles I've been expounding. The oceans warming after polar ice has receded sufficiently, for example. It's par for the course. I used to say the same things to environmentalists back in college. They'd be saying how the Earth was going to be 4c warmer by 2012, and I'd say the same things I say on on this site now. The Earth is buffered by so many things, the most significant of which WAS, was, was! polar ice/glaciers, which were very powerful. Now with their recession, particularly in the Northern latitudes, and I remind you heat/weather flows from equator to pole, the oceans have begun that burden. We see what happens. And now, we are back on topic. Because this kind of thing in this article is exactly what heat, not CO2, and simple modeling of the Earth predicts. I'll accept you awe now. I don't know what channel you've been watching, but I have debunked every one of your "theories" I have come into contact with. I have done so quite thoroughly, and with detailed explanations of how you were either ignoring or misconstruing various fundamental physical principles along the way. You had no answers, other than to get increasingly nasty and dismissive and start calling me names .. and of course to keep repeating your freshly debunked statements over and over. That would indeed be good, except it's not what you do. Not with me .. I raised issues right from the start, but you refused to provide the requested explanations/sources. Don't hold your breath. You have never once given any indication that you even understand the physical mechanisms behind the greenhouse effect well enough to justify having an opinion about whether or not they are valid, let alone to summarily dismiss them as you do. You have your little toy experiments that miss the point completely, and you give numbers that don't match accepted MEASURED values, and refuse to explain how they are calculated. That may be simple, but it ain't science. A good almanac, which gives the total fossil fuel burned by all countries, proves you wrong. Dude, it's not even science. It's simple addition. You don't even need to know how to reduce scary integrals; it's only accounting. Score... man i'd better go stock up on some more nose wax, these clowns keep winning first prize like monkeys jumping at bannanas, and that...makes me smile. DA S, which username were you before, again? Wiki proves me right, make an incorrect assertion to prove your emotion why don't you? Wiki proves me right, make an incorrect assertion to prove your emotion why don't you? So, "wiki" clearly shows that anthropogenic waste heat from fossil fuel combustion and other industrial processes cannot possibly be the DIRECT cause of global climate change, as you claimed. Calculate how much energy in Watts/m2, from fossil and Nuke. This is a simple unit conversion, divided by the Earth's area in meters-squared. Now calculate for me that released by CO2. Derive it from concentration please, no ad hocs. Newton's laws or variations, please. 10 to 1 you scuttle away. He's on that crap again? mmmmBwahahaha. What an idiot. Being wrong happens to all of us; but being wrong by four orders of magnitude is... special. Heh. Oh, Da S, I understand your problem now, you're an idiot. YES, it IS 4 orders of magnitude weaker than the Sun. But, if it were equal, we'd no longer be alive. If it were 1/100th we'd all be dead. If it were 1/1000th, eeh, I really don't know, it don't sound good,but since it's 1/10000 (or so), it simply and but subtlety biases heat upward. Since it is released on the ground it is more profound than the Sun, if you compare apples to apples. What was your username before, again? Yep it's simple: 1.439 x10^17 Watt hours per year (2008 value) is 1.642x10^13 W avg. power .. divide by 5.1x10^14 m^2 (surface area or Earth) to get, 0.03 W/m^2, the value I quoted before. Now calculate for me that released by CO2. What is your basis for those claims? Do you realize that the surface of the earth itself is a emitter of thermal radiation, giving off about 400 W/m^2 according to the Stefan-Bolzman law? Did you read the Texas A&M link I posted earlier? An additional 240 W/m^2 would change things, but it's not obvious "we'd be dead". You really don't have a clue, do you? 240 W/m^2 is the radiated power from the sun *that gets absorbed by the Earth*. Radiation from the short-wave part of the solar spectrum passes through the atmosphere pretty efficiently, with about 170 W/m^2 getting absorbed *at the surface* by the ocean and land. Still about 4 OM bigger than 0.03 from anthropogenic sources. Yeah, DLK, your math is wrong, big surprise. Big predictable surprise. Didn't do the math for CO2 either, tried to weasel out of it, blah, blah, blah, big predictable surprise. How is it wrong? Please be specific. I postponed answering because I have other (better) things to do right now ... I seem to you remember doing similar things in the past when you were too busy to engage with a complicated calculation for someone else's benefit. Furthermore, I told you exactly where you can get the information for yourself if you don't want to wait for me to summarize it here for you. In short, you can revert to dismissive jerk mode if you really want to, but it won't help validate anything you have said here, any more than it did on other posts where I systematically dismantled your deeply flawed "theories", poorly thought-through arguments, and error-ridden calculations. I'd also suggest the ScienceOfDoom series on atmospheric radiation that starts here: http://scienceofd...art-one/ . This would be useful for WP since he's indicated that he doesn't really understand that at all. I might also suggest WP read up on the greenhouse effect (http://www.realcl...argument - but don't miss part 2, http://www.realcl...argument-part-ii ) because WP has indicated that he hasn't a clue how it works. And, as a "physical chemist", WP might want the view on water vapor from the ACS (https://www.acs.o...co2.html ). Or maybe he'd like to ignore the science some more ;). Does Sinestro still lead the Science of Doom? Or is it Grod? It's been so long since I visited a pseudo science site, I forget. Why is it I am always EXPECTED to teach you AGWers how to do math and calculations, and all you ever do is criticize as a prelude to pigeon chess? The deniers are wrong, but at least they're educated. Hmmm, most of the actual scientists who predict global warming seem to be professors. Are you seriously alleging professors aren't educated? Did anybody else notice that "jeffensley" (AKA Li Ping Chong or whatnot) never denied being a Chinese propagandist spammer? If you pay attention you can always tell what's really going on. Build nuclear plants and invest in solar power satellites, "jeffensley." Save the planet. Remember, China will be harder hit than the US, Europe, and Russia by rising sea levels. When a billion Chinese decide the gummint screwed up, all the nuclear weapons in the world won't save your sorry a$$. They'll be coming for you. I wouldn't care to be in your shoes, and I have at least some sympathy. But don't build thousands of coal plants; that sympathy will evaporate in a heartbeat. Probably Captain Li Ping Chong, actually, upon reflection. You guys do realize how transparent you are, right? And how paranoid? I have no desire to watch half a billion Chinese die. I am an ethical man. I advocate giving you another choice that will save us all, and still get you what you need. And I guarantee you this: if you continue down the path you are following there are those who will express their racism by advocating your destruction; and you could have dealt with the ones like me, instead of the ones like them. You will regret this time, "jeffensley," and remember it as one of the times you could have changed things and survived. You have it upside down. You are expected to LEARN math and calculations, although I guess after several iterations like this, it's becoming clear that you may be incapable of that. 1) WP made silly claim contradicting accepted science, with no explanation or support beyond "Wiki says so"
Given your history of sloppiness and fundamental errors, it's up to you to produce something more than unsupported claims and snide commentary. Yes, he is unabashedly claiming that ... it seems to be another aspect of the Dunning-Kruger pathology. When faced with the collapse of their precious "theories" under the cruel weight of logic, reason and facts, they could accept their mistakes and move on, discarding said "theories" as incorrect and useless. Instead they double-down, making increasingly bizarre statements that are even more obviously wrong, often in the form vitriolic (and ludicrous) attacks against the credentials of the actual experts in the field. After all, nothing is as powerful or persuasive to them as their own "enlightened" narratives, bouncing around inside the echo chambers of their skulls. DLK, speaking of sloppiness, which username did you think you were using in the above posts? Let me guess, since you were (in you own mind) supposed to be reasonable and educated, you thought you signed on with username "thermodynamics," but accidently signed as DLK. Incidentally, several posts above I saw similarities to Captain Stumpy, but since I wanted to see if Stumpy and thermodynamics were the same, AND you were the same, I accused your Stumpiness as being thermoness. See what I did there? Why can't you prove/qualify ANY of your claims ? 1 "4 technical degrees" ? 2 Claim CO2's radiative forcing is 0.00009 W/m^2 ? 3 Claim wiki is in "Great agreement" with you ? 4 Why wiki shows 1.5 W/m^2 which is 16,666 X your faked figure ? 5 Business use your figures ? 6 You are a leader in "Predictive Analytics" ? Start with just ONE of these, from first principles PROVE your claim CO2 is a "red-herring" & your specific figure of 0.00009 W/m^2 has *ANY* basis in reality ? Y can't U do that ? Have been reminding you to prove your claim very often, Y can't you do that Water_Prophet ? Heard of a kid who "cried wolf" ? Your faked claims show you have nil credibility & are anti-Science. Water_Prophet acts like a Pathological Liar ! & as per form Mikey, who has already been discredited more times than I care to think about, claiming and posting degrees in what? Pyrotechnics? Electronics? can't even talk the talk on them or the background you'd need to get them. Meanwhile trying desperately to redirect the conversation away from DLK/thermostumpy's goof. I wonder how much more BS they will dump to cover it over? No. You asked I prove my claims, I did but, you have NEVER proven ANY of your claims, especially the most feeble faked eg CO2 ! Just start with ONE of your claims or thus be confirmed as a "Pathological Liar" ! Reminding you, this is a website, and you have no right to expect an answer. Reminding you your behavior on this site gives you no right to expect an answer. Reminding you, if there are any claims I haven't proven, expressly, it is because you like to post the above to the detriment of the site, or you don't have the neurons to understand them. My facebook is set not to release information to people I don't know. That's not complicated is it? PS Why, do you think Gregory M Tyler is special? RiskAoA is listed on my facebook, publicly. Water_Prophet, you made claims in public re degrees doh, its that simple ! This is a Science site, now be a good little fetus & PROVE your claims, why can't you ????????? 6 Leader in "Predictive Analytics" ? Start with ONE of these, from first principles, CO2 claim ! What the hell are you talking about? All I ever talk about in my posts is science .. I'd LIKE to talk about serious scientific topics, but I always seem to get drawn into these situations where you post some utter nonsense, I point out where you went wrong, and then you dive further down your little rabbit hole of delusional pseudo-science throwing up red herring after red herring to distract from your original mistake (with the latest example being this fantasy about your detractors using clone accounts to debunk you .. why bother? debunked is debunked), and never providing one shred of justification or supporting evidence for your garbage. So, back on topic. As I showed, the 0.03 W/m^2 follows quite naturally from (your own) values of total power generation and the surface area of the Earth. If as you claim, my calc. is wrong, it should be trivial to point out my mistake. What part do you think I got wrong? And oh, yeah, the fact Mikey is trying to bury. The ONLY pathetic one is Water_Prophet, who has NEVER proven/qualified ANY claims EVER ! Grow up or go away ! I vote Water_Prophet be banned, all he does is make idle claims obfuscating Science. Water_Prophet is a Pathological Liar ! There are so many showing immense patience with you Water_Prophet, you FAILED yet again. DLK, you MULTIPLY by time to convert watt hours to watts, just for beginners, you'll need to go to seconds. I can't tell if you are really this obtuse, or pretend to be for the pleasure of other viewers. What I don't get is, if you're wrong, why keep playing the harp about it? Start with ONE of these, from first principles, CO2 claim please ! YOU stated CO2 was 0.00009W/m^2 BUT, why can't you prove/qualify or show working ? No you high school ignoramus ! Are you trying to claim Joules or some oddball integrative of Joules X Time - for what purpose ! The delivery of energy per unit time is POWER, do you get it now Water_Prophet ? WattHours is ALREADY in Joules divided by 3600 secs per Hour, do you get it now Water_Prophet ? Just what are you trying to show, you so easily for a trained 4 degree graduate, make stuff ups ? Seems you just make stuff up ? IOW Water_Prophet, you are an uneducated failure as a Pathological Liar & fail yet again ! 1 Watt-hour = energy delivered over one hour from 1 W avg. power = 1 (J/s)*hr * 3600 s/hr = 3600 J. In your wiki link, they give energy (in W-hr) delivered over a year, which can be expressed as an average power since it's just (total energy)/(total time). That is the calculation I did for you, but it appears I gave you too much benefit of the doubt for being able to fill in the blanks for yourself. Do you get it now, or do you still think I am wrong somehow? You show you know NIL about radiative emissions, how can these/any planets possibly be below the Cosmic Microwave Background radiation level of ~ 2.7K - Capisce' ? Heard of asymptotes, just how long do you thing it takes a planet to drop to below CMBR, LOL ;-) ? Making more claims again Water_Prophet, without a shred of any thought, evidence or rationale ? Why can't you have an original thought Water_Prophet, is it because you lack those "4 technical degrees" you claimed publicly, so you can't connect physics with maths with feeble intuition one bit ! ? So sad, not one original thought, no education and above all a Pathological Liar ! I give up, keep repeating and believing meaningless nonsense. Google does unit conversion for you, etc., and you don't care about reality anyway. Now now, watermonkey is still in mental school, can't grow up yet, but only the classes he manages to attend without knocking himself out at the front door because of forgetting to turn the doorknob. FFS then stop making stupid idle arbitrary obviously inane dumb uneducated claims that prove unequivocally you are WAY out of your depth obfuscating scientific process upsetting others ! You Water_Prophet are a complete ignoramus and doing Science an immense dis-service ! F..k OFF, get an education, learn integrity along with maturity and think before you post you d..k ! If I hear from you again I'm making complaints til you are banned - you dumb idiot, your posts you don't have "4 technical degrees" & your posts also prove U FAKED a CO2 figure of 0.00009W/m^2. Water_Prophet you have NO credibility & have NEVER showed any value here ever ! Water_Prophet you are proven as a Pathological Liar ! Go away - permanently, no one accepts ANY of your LIES, you need to rest in a mental home asap ! Sorry, I give up on you and your sock puppets. Then disappear NOW as you are NOT welcome, or if remotely possible in years get earnestly a formal education as many here and become a true scientist and prove/qualify ALL your claims or don't f..king bother to come back ever, vamoosh, begone you complete IGNORANT d..k ! One final, were you deliberately obfuscating by implying that I meant 3/10th of the average Sun's radiation that makes it to Earth? 3/10th of the fluctuation, usually associated with sunspot changes. Why? Because fluctuations in the Sun's output have noticeable effects on climate. It fluctuates ~1/1366, of 255, are things in perspective for you now? And you call me unethical. I give up, keep repeating and believing meaningless nonsense. Wow wow wow. This is a new low, even for you. Just admit it .. you made a mistake. It can happen to anyone, but not admitting it leaves you locked in place intellectually (which explains a lot, actually). I have practically rubbed your nose in the right way to do the problem, yet you are steadfastly refusing to accept it. Who needs google for something so simple? I don't, but if you do, by all means check my answer however you want to .. I am quite confident you will get the same answer (if you set it up correctly). There are only two places I can have gone wrong .. either it was with the numerical part, or else with the units. I showed you the units part .. do you think I made a mistake in there somewhere? Can you point it out? Or do you think I punched something into my calculator incorrectly? Why is this so difficult for you? Yes, you are a LIAR & a CHEAT & do NOT belong here. show your claimed figure of 0.00009W/m^2 is WRONG ! Go away FFS & allow room for real budding scientists & the earnest who seek an education with integrity room to discuss so they are NOT distracted and misled by your failures of logic, maths & education ! FFS , p.ss off, you have repeatedly lied and failed to offer ANYTHING useful - EVER, wasting time ! No original thoughts from you Water_Prophet, work them out BEFORE posting, stop wasting time again ! Actually, DLK, thermy, etc. I do owe you an apology. 0.03watts/m2 is correct. I thought you were contradicting me on the 3/10th being .3. Given your history, you can see why I'd assume you were wrong. 255watts/m2 /1366 is the fluctuation, of the Sun, which implies 0.2 watts/m2 drives noticeable climate change which means that 1/10th of it or ~0.03watts/m2, is going to produce climatic effects. Especially since it is an addition at ground level. I think I got confused between your assertions and Mikey's idiocy. You can see how I might do that. I think it will also convince you of quite a bit of error in wiki's 1.5watts/m2. That would mean it is above the Sun's fluctuations. Now think about what insulation on that order of magnitude would MEAN, and if you are a reasonable person, this should change your opinion. I honestly can't tell what you are trying to say here. It looks like you are trying to compare the (average) radiative flux absorbed by the earth (~240 W/m^2) with the total solar radiative flux at the (average) distance of the earth from the sun (~1366 W/m^2). That's ok I guess, but only the first number is really meaningful for understanding the radiation balance of the earth. The other mistake you seem to have made is that you are assigning units of W/m^2 to the ratio of those two values, when it is in fact dimensionless (since they both have the same units). Let's leave it there for now .. did I understand what you were trying to show correctly? Negative, buddy, the fluctuations in the Sun have significant impacts on climate. In fact you can see them. 1998, 1978, etc.. Not exactly a 100% correlation, within +/- <2yrs. This is pretty conservative to my arguments, considering the Sun's total isolation. If you can find me one expert on either side of the climate debate who will tell you otherwise, I'd love to hear it. Because I've spoken with hundreds, both quantitatively familiar with the Sun's contribution's (a handful of those hundred) and just familiar with them. Anyone, even wiki and it's associated source claiming there is an effect greater than this is touting propaganda. No. Real scientists who actually had "4 technical degrees" could NOT be confused because they can SHOW working as to HOW they arrived at 0.00009W/m^2 ? It does NOT, smarter people than you have worked this through & although I appreciate the maths, it is not currently in my focus to derive it at length but, it seems valid. Water_Prophet offer a basic fundamental as to WHY it might NOT be correct, heard of natural logs & WHY they are per-eminent in these function types. ..if you are a reasonable person, this should change your opinion. You mean uneducated, manipulated by your brand of 'intuitive'. There are so many areas you have FAILED at immensely, you f..king pr..k ! Go away, you are wasting everyone's time you uneducated LIAR of a d..k ! 1. "4 technical degrees" ? 2. CO2 is only 0.00009 W/m^2 ? 3. Business uses your results ? PROVE EVEN ONE OF THEM ! Try CO2 of 0.00009W/m^2, thats easy its only maths, not years of study at a university like educated ! Ooohooo.. i like.. i like, water monkey really rubbing it in his nuts tonight.... i just love handing out those 1 out of 5s.... c'mon monkey sum more now... c'mon..
Ok, I understand what you were trying to say now .. fluctuation is +/- 0.5 W/m^2 out of 1366 W/m^2, and you just applied the ratio (1/1366) to the absorbed power to come up with 0.2 W/m^2 (really +/- 0.1 W/m^2). That much seems fine, but I'll just mention again that I don't agree at all with the conclusions you draw from that number relative to 0.03 W/m^2 from anthro sources. I guess we need to tackle the details of the CO2 calculation so you can see why 1.5 W/m^2 is reasonable. it would help if you read up on those ScienceOfDoom links first. I have stuff to do for the next several hours, but I'll try to get back to it tonight. Well, DL, draw what conclusions you like, but draw them. Obviously, this is new information to you, so you should see how it impacts your views. The Sun's fluctuations provide an excellent baseline for the magnitudes of energy required to create climate change. Think about it, if the Sun changed significantly more or less, life on Earth would be dramatically different. Even a little and climate would be markedly different. Something that adds, not just cycles, more than these effects MUST have profound and inarguable effects on climate. Since people continue to argue, it don't pass. I think you should integrate the new information you've just learned before I re-read "Science of Doom" propaganda. For example, the world ain't gonna be doomed, regardless. I guess we need to tackle the details of the CO2 calculation so you can see why 1.5 W/m^2 is reasonable. it would help if you read up on those ScienceOfDoom links first. I wish you lots of luck really, Water_Prophet has Never taken ANY interest or EVER responded to any query whatsoever re his claim CO2's radiative forcing is other than a claimed 0.00009W/m^2, why, well because for months he has claimed CO2 is a "red herring" and is "anemic", his Dunning Kruger & egotistical need for personal aggrandizement precludes a change in position, despite a minor correction, that's just a tactic & have seen it before with those he wished to ingratiate & fails ! Strange thing is Water_Prophet's claim of 0.00009W/m^2 is in "great agreement" with wiki's 1.5 W/m^2 despite Water_Prophet's being 16,666 times LOWER. Yet, you STILL have failed to prove your claim of CO2's radiative forcing of 0.00009W/m^2 has a foundation, ie ANY basis at all ? I think you should integrate the new information you've just learned before I re-read "Science of Doom" propaganda. For example, the world ain't gonna be doomed, regardless.Yet, you STILL have failed to prove your claim of CO2's radiative forcing of 0.00009W/m^2 has a foundation, ie ANY basis at all ? DLK et&al, all this time of mocking, and you didn't even understand what I was saying. I can forgive you pretty easily though, it is not like this very basic information enters into the mainstream, media, etc..
And how could it really? Journals don't usually report old news. It must be in some way novel. What would the report to Geophysical Letters look like? "Solar Fluctuations still affecting Climate." LOL. Anyway I would like to know how this new info affects your world view, much like the Homosphere should have. Water_Prophet is a troll, and accepts any response as affirmation. Not responding is the best way to deal with a troll. If they get no response they'll go troll elsewhere. What Da S said is actually fine with, so long as you don't ankle bite as well. However, before you go, one courtesy. Allow me to know how knowing this information, that CO2 is supposed to be 10x more powerful than solar variations and that fossil fuels energy emissions are right where they need to be to cause what we see, had affected your perspective. Here is a good example of how WaterDummy actually does learn things now and then and then he pretends it is obvious to him and draws really stupid conclusions from good data. On May 7 2014 I learned about the homosphere and taught it to Alche. He still doesn't understand it but he thinks he does and thinks it helps prove CO2 is not important. Nothing could be farther from the truth. Here is where I learned about and taught WaterBowl about the homosphere. In fact, it shows why CO2 is important for holding heat in the atmosphere. Alche/WaterBowl just has no idea how radiative heat transfer works. I am pretty sure you couldn't understand it to save you life, but upon inspection, for me, I input water vapor and contrast it with CO2, and come up with my usual conclusions. Why can't you do that? Why is it you didn't acknowledge that the homosphere's mechanics worked against your position? They worked great for mine. Anyway, since you can't be mature enough to answer as DLK, but have to obfuscate as your sockpuppet... I guess anything to not admit you learned something contrary to your opinion. Don't be such a jackass, of course I understood what you were saying. You have made so many trivial mistakes with calculations and fundamental science in your posts that I didn't know how to parse your most recent one, and I wanted to make sure I knew what you meant. Your point is a staple of the denier camp, to wit: nothing man-made can ever have more of an environmental impact than the sunspot cycle. It's just as arbitrary and wrong when you say as when they do. It's not like the solar fluctuations aren't well-understood AND incorporated into the models. Please read this link from the American Chemical Society, playing particular attention to the figure at the end. Also, why do you accept measurements and models from some scientists and not others? Solar cycle:right, but CO2 forcing:wrong? You are either wrong, or utterly full of it. You are dealing with real mathematical physics here, and these are the equations that ultimately lead to the accepted result for CO2. If you would look at Science of Doom, you would see in detail how this equation (among others) is properly applied to this problem. Crud. I just noticed I messed up the quoting on my last post. Those last two lines are from the post of WP that I was replying to. DLK, So, you seem to repeat that you understand what I am saying, but you keep claiming I am a Denier. I am not a Denier, I was an absolutest about Anthromorphic Climate long before anyone considered it fact. It would be nice for someone to consider that my crack-pot understanding of physics lead me to be adamant about climate change, many many years before it was popular or accepted. We can come back to radiative forcing if you like, but if you are a M. Phys, then taking it down to two gases should make it very easy for you. But in the meantime, we are talking about the ~0.03Watts/m2 from fossil fuels, the 0.18Watts/m2 from solar fluctuations, and some how ~1.5watts/m2 being something to be taken seriously. I am going to go back to being civil, and I hope you forgive previous transgressions. Please respond as DLK, and only DLK. If one of the other blocked folks has something interesting, you will have to reprint it. As a mark of sincerity, I will research, as I should have done long ago, the accepted impacts of the Solar Cycle. Though in hindsight, these have become more and more difficult to find. They may be easier to derive, and if so, I'll pass my method on over to you for criticism. But to keep objectives clear, the object is to demonstrate that 1.5watts/m2 is inline with observations, instead of a spurious number needed to show it's more important than other factors. Honestly, I am not sure how you'll do it; cycled 0.18Watts/m2 has profound effects, a "DC offset" of 1.5Watts/m2 should be killing us. The Sun after all brings us from 2.7 K to ~298K... if you see what I mean. I would like to get this thread back on topic and offer a link to do just that. Water_Prophet mumbled about knowing "..fuels energy emissions are right.." yet as before there is NOTHING to prove or even qualify such naive claim. Water_Prophet implies he knows there is a proven relationship between observed climate change & the heat generated by fossil fuel use but, again, Water_Prophet has never shown such working. Isn't it better to directly challenge those that make claims re Science so the momentum of the progress of Science is NOT obfuscated by the immature ? The first couple of times, maybe. After that it's a waste of time and effort, because you're dealing with someone who will lie to make their point, and isn't going to admit they're lying or stop. Wrestling with pigs is a waste of time; it gets you dirty, you can't win, and the pig enjoys it. No. Well only if Water_Prophet has no understanding about specific heat, radiative heat transfer, thermal inertia, spectroscopy - ie Just like someone who has NOT achieved the "4 technical degrees" as Water_Prophet claimed. Where is there anything Water_Prophet can show which proves his claim "should be killing us" ? Wouldn't it be far smarter for Water_Prophet to focus on the Science & the highest ethic of the process which demands some discipline ? This is why you must focus on the Science and please not bring this down to a level of wrestling, I think that is beneath your best ethic and mature intentions. The point has been made & perhaps you missed it in your absence that Water_Prophet has changed his position, that in conjunction with addressing claims is a worthwhile exercise because, as I have stated, the younger naive & still uneducated read these posts and it is helpful to them to ensure we address claims and where possible maintain the accuracy of the progress of Science. No doubt the pigs are impressed. Mike, you don't lie, so I won't ignore you- and I think I made my point, so I'll drop it now if you will. But I hope you'll remember that feeding a troll makes them troll more. The only way they stop trolling is if they don't get fed. There's even an acronym for it: DNFTT. Do Not Feed The Trolls. Let WP declare that he's been lying and avoiding, and ask for real information and take the trouble to learn from it, and I'll take him off ignore. Until then, it's a complete waste of time. Here is a good example of how WaterDummy actually does learn things now and then and then he pretends it is obvious to him and draws really stupid conclusions from good data. Once you understand the concepts therein, we can discuss the details of how the CO2 value is calculated. It will also make it clear why the stuff you are claiming about the supposed "profound" effects of 1 W/m^2 peak-to-peak fluctuations from the 11-year solar cycle are non-sensical. That effect is understood and accounted for, and it is negligible (thus so is the smaller direct heating from human waste heat). So I read your link. It has the same fallacy propagated OUTSIDE the IPCC. That somehow lifetime is important to the Green House Effect. While lifetime is important in the dynamic case. It means nothing in the steady state. For example, CO2's concentration is pretty stable year by year, and changes in the Earth's temperature are relatively stable year to year. Water vapor's concentration has essentially not changed, (nor has CO2's). Now methane and etc., their life time is important . They don't last forever, therefore a time integral is important. So now I've read it, it says zero about proportion. There is still no way that 1.5watts/m2 will not cause tremendous impact to the climate, short term. Given our above discussions, it should be apparent how really incorrect your sites are. How much energy is incoming at the top of the atm? How much of that is diffused by high altitude GHG? Thus effectively repulsed. How much is diffused by low alt GHG? Thus absorbed. Now, the absorption band of CO2 is very narrow. What fraction of the thermal spectrum does CO2 absorb? Now Water Vapor has only two relatively broad bands, BUT, if you will regard it's absorption spectrum, it never really goes to zero, and has about 4% competition with CO2 in CO2's band, at EQUAL concentrations. Now, if you are a mathematical physicist, it should be trivial for you to take an average ppm for humidity, 20000ppm is pretty good, discounting the tropics, and use 400ppm for CO2, and calculate just how small CO2's contribution is. ~50% in it absorption band. Elsewhere, it has zero and water predominates. On top of this, we have the upper/lower atm effects of CO2 only having changed 135ppm. Is that 135ppm responsible for 1.5Watts/m2. If yes, then you have troubles, if no, you have nothing. Water Vapor, then has increased 435 ppm, and so on and so on. The multiple compounding fallacies of CO2 should be making your head spin about now. Doesn't 0.03Watts/m2, or 3/10 of the Sun's Fluxes explain so much more now? CO2 should insulate, for example, are changes in climate consistent with insulation? Aka warmer, but milder, like in your home? Or are they more consistent with heating without (sorry the analogy weakens) insulation? Is weather becoming more extreme. These kinds of questions are precisely what is addressed on the Science of Doom website that I linked. The answers on there use fundamental physics and go step by step, with LOTS of examples and as much math as you can keep down. Don't let the name fool you .. the site is basically agnostic with respect to AGW .. its goal is helping people understand the peer-reviewed science. This is all your delusion. If you set it aside (at least temporarily), open your mind and read the actual science from actual scientists on the links that have been posted for you, you will at least have a chance to understand why it is so wrong-headed. Delusion? This is the best the great mathematical physicist can come up with, quoting me, a pretty useless thing to do, then seriously using the word delusion? You are under the impression that I haven't read or re-read your science of doom under that name and many other tedious pseudo-and propaganda sites many many times before. Pardon the laughter, I just find it very amusing you seek to segue to propaganda sites rather than take the questions and assertions head on. I mean I can generate statements that take my own assertions on. The laughter is because you can't. Take Da Scnieb's advice. Or open your own mind. Because it could very well be I am wrong. But the facts above leading to my conclusion are not. At least most ways I can see. Yes, because you would not characterize it as propaganda if you had actually read it. If you think differently, please find a piece of "propaganda" on that site and link to it, keeping in mind that detailed expositions of fundamental science making reference to peer-reviewed literature don't automatically become propaganda just because you haven't put in the effort to understand them yet. The reason I am not engaging is that you haven't posted anything worth discussing yet .. just the same very basic misunderstandings that you have posted before, and could dispel for yourself with a couple of hours of careful reading and reflection. Also, you just spewed out about a dozen different things .. if you really want to talk about them, at least pick a favorite to tackle first. Ah, now that just looks like sophomore level psychology. Somehow boring, decade old GW propaganda is worthy of attention, yet details you admit you didn't know are "not worth engaging." Let me apply my own primitive psychology. You've been confronted with details that make you uncomfortable, rather than face them, you run for the warmth and shelter of the familiar. Its plainly obvious, the longer its there the more *cumulative* radiative forcing, why is that hard for anyone to understand ? Wrong. The 1.5W last second has a portion added to the 1.5W upon the next second ie Cumulative esp also as CO2 is rising ! Why can't Water_Prophet understand simple concepts & measurements, is he sane ? Thats obtuse. Integration is summing, you need to learn the mechanisms for eg CO2 being removed as much is above sea level then absorption by oceans is a slow process. Given dissassociation/activation energy for CO2 what can Water_Prophet imagine is ANY chemical mechanism for its departure from the atmosphere that is comparatively fast in comparison with addition to the atmosphere ? Is there ANY Evidence for Water_Prophet's claim ? What does Water_Prophet imagine is the definition of "short term" re climate, perhaps 300 yrs ? When will Water_Prophet get Physics ? How much energy is incoming at the top of the atm? Close enough to figures Water_Prophet accepted ! How much is diffused by low alt GHG? He forgets the frequency is absolutely important & an imperative in terms of absorption & re-radiation ! Large amount of energy from Sol is short wave (SW) visible which mostly passes through GHG's unaffected, whereas Earth's surface converts SW to long wave (LW). This is something I have repeatedly advised Water_Prophet he learn but, still FAILS to understand, see link at end ! Now, the absorption band of CO2 is very narrow. What fraction of the thermal spectrum does CO2 absorb? He has been shown answer many times, is he mentally ill or does it appear he is just trying to be irascible ? Water_Prophet FAILS to understand the bands of H2O vs CO2 are DIFFERENT, therefore their effects are NOT competitive, they are CUMULATIVE ! You need to use the correct formula because relative figures are WRONG, one must calculate properly as ANY trained "Physical Chemist" SHOULD know and manage easily ! No, claims need to be proven/qualified ! This is why education in Physics is so VERY important for AGW deniers ! yet details you admit you didn't know are "not worth engaging." You have not posted anything that I didn't already know. You are (deliberately?) misconstruing my confusion over one of your posts that was poorly worded, which I agreed with after you clarified it. I have since posted at least one link showing you how current climate models account for fluctuations in solar irradiance, and find it to be a minor effect: i.e. this is old news and not surprising to anyone familiar with the climate change discussion. NN: Link quoted by Water_Prophet yet its clear he has not been able to plug in the numbers despite his claim of "4 technical degrees", we can sympathise because Water_Prophet always has immense problem proving ANY of his claims & the maths is beyond high school level ! But why did Water_Prophet, not go through the link offered by DarkLordKelvin ? Water_Prophet CANNOT appreciate the simple log formula given to him by runrig is the ADDITIONAL radiative forcing beyond a baseline of ~280ppm ! This is just one of the problems with Water_Prophet, he cannot focus on a straightforward scientific point and still continues to make arbitrary claims centered around his ego. Hypocritical for Water_Prophet to offer as he's claimed wikipedia is only propaganda ! Good luck DarkLordKelvin, I wish people like Water_Prophet would NOT obfuscate and make idle stupid claims affecting others but, instead focus on essentials. I will also be looking for a full evaluation of CO2's R forcing for below the 280ppm baseline. Hmm... warm blob. Did the AGW Cult's False "Profit" Al, go for a swim? ie No relation to any useful education or knowledge of Physics so instead Water_Prophet imagines he is some sort of prophet & tries to craft an original thought but, can't do this to extend prevailing knowledge as he never got an education in any of the "4 technical degrees" he claims ! The biggest blunder Water_Prophet made was to claim CO2's radiative forcing was only 0.00009W/m^2 AND claimed this very small figure is in "Great Agreement" with wiki's which is 16,666 times LARGER ! Why can't Water_Prophet show his working, high school kids can for their maths but, not him ! Clear evidence Water_Prophet's ego exceeds any good sense or even BASIC arithmetic ! FFS, its not smart to claim someone didn't do something, DE's are covered in high school, ugh ! You're confused, Never claimed to be a meteorologist, if you imagine I did - Prove it please ? Really ? name of institute & year started please ? You're doing fine Mike, thanks for putting the value of your understanding and experience about science on these comment sections.